The Honeysuckle, Lonicera caprifolium, receives numerous popular names such as Italian honeysuckle, goat leaf honeysuckle, chupamiel, Caprifole or Woodbine Perfoliate. The Honeysuckle is a vine plant belonging to the Lonicera genus that grows in the warm and temperate parts of the northern hemisphere. It can be found in areas with a Mediterranean climate in Europe. Honeysuckle extract provides numerous beneficial properties for your body that serve to combat various ailments such as asthma, cold, flu, skin problems or fluid retention. What is the Honeysuckle extract? Honeysuckle extract is extracted from a medicinal plant that belongs to the botanical family Caprifoliaceae. Honeysuckle plant can reach 6 meters in length being its woody and reddish stalk. The honeysuckle flowers in the months of May and June with a size in its flower of between 4 and 5 centimeters. Its color is white or purple on the outside and white on the inside. Both the bark and the leaves of the honeysuckle vine have numerous properties; however, their berries are toxic and should not be used. All these components also have anti-inflammatory properties, which helps to combat the aforementioned respiratory problems. 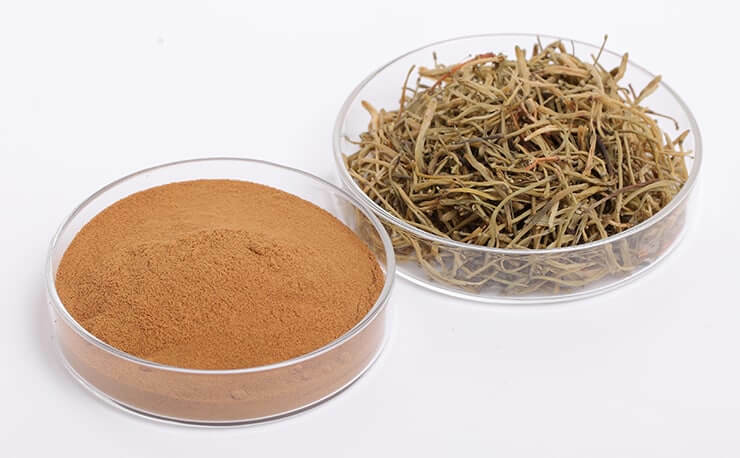 Other properties of the Honeysuckle extract are hepatoprotective, that is, it has a series of qualities that protect organs such as the liver by improving the functioning of liver cells. Thanks to its numerous properties, the benefits of honeysuckle are several to be used to combat various ailments. First, it is used for the treatment of respiratory diseases: cough, asthma, bronchitis, flu, tuberculosis and cold. In this sense, add that honeysuckle having sedative elements such as geraniol is used in the treatments of nerves, anxiety, sleep problems and arrhythmias. Secondly, its hepatoprotective characteristics have been used to combat liver diseases such as hepatitis or jaundice. Third, the honeysuckle plant works on treatments for fluid retention, arthritis and kidney stones due to its diuretic qualities. Finally, another benefit of honeysuckle extractss is related to injuries and skin problems: sores, wounds, angina, wrinkles or bleeding gums. How the Honeysuckle extract is used? Honeysuckle extract is generally used in infusion. The parts of angiosperm that are used are the honeysuckle flower and the leaves. Remember: their seeds are toxic, so their use is not recommended. To prepare the infusion of honeysuckle it is necessary flowers and / or dry leaves. The most used proportion for the infusion is 10 grams of honeysuckle for one liter of water. Once mixed, heat the mixture about 5 minutes until the water starts to boil. You can take it as is or sweeten it with stevia. When you have the infusion, it is advisable not to drink more than 3 glasses a day. To prepare oil from the honeysuckle plant, a minimum of one flower cup must be collected. They are then placed in a sealed bag without air and placed on a solid and smooth surface. A roll is passed over the flowers so that they break and are thrown into a glass jar. The next step is to heat a glass of sunflower oil, sweet almond or argan oil until the temperature is 65 ° C. Pour the oil into the bottle where the flowers are and close it. The extract should be placed in a cool, dark place for about 6 to 8 weeks. Once ready, sneak to remove the solid parts. This solution is used for external ailments such as skin wounds, sores, cuts, burns, wrinkles, etc. As with any medicinal plant, it is recommended that it be used under the supervision of a professional. The stem and leaves of the creeping honeysuckle have saponins, an element that can have toxic effects. According to the FAO, the main effect of saponin is to damage the level of cholesterol in the liver and blood. This causes less absorption of nutrients in the body. Its effect is not confirmed orally although it is highly toxic when administered intravenously. For this reason, the use of Honeysuckle extract is not recommended in minors or in pregnant or lactating women.